Started by Donita K. Paul in 2004 to celebrate the release of Dragon Spell, Appreciate a Dragon Day is today, January 16th. In honor of the day, here are some picture books you can share. 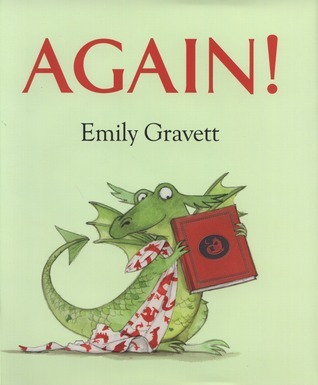 Publisher/Date: Macmillan Children’s Books, an imprint of Macmillan Publishers LTD, c2013. An unnamed crocodile sees all his crocodile siblings enjoying swimming, diving, and going underwater, but he doesn’t like it. He realizes why one day when a sneeze reveals what he could be good at instead. 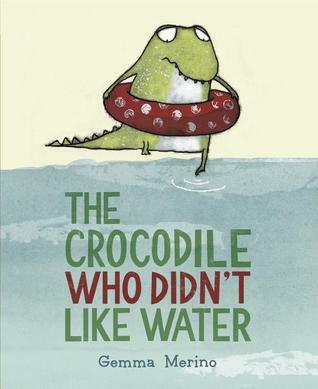 Debut author/illustrator Gemma Merino adds hints throughout the primarily blue, green, and red pictures that this crocodile is different, from the eggs being carried on the end pages to his shoes, his coloring, and finally the little nubs exposed on his back. A simple story that lets children know it’s okay to not be good at something, because they’ll inevitably be good at something else. Publisher/Date: A Feiwel and Friends book, an imprint of Macmillan, c2014. Dragon isn’t afraid of anything, and roars to prove it. But what’s that sound? That couldn’t have been him. Oh no, something else is roaring in the forest! He seeks comfort from the unknown among his forest friends, and they work together to chase it away. Kids will laugh at the dragon’s antics, being clued in by the expressive, in-the-know yellow bird that dragon is being silly. Their dynamics with each other remind me of rational Elephant and overly-excitable Piggie by Mo Willems. 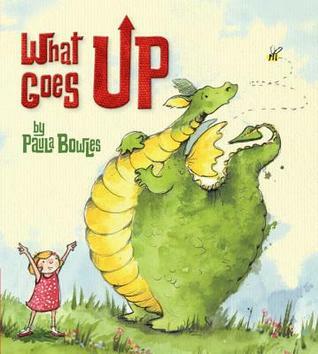 Add this to a dramatic read-aloud and be prepared for kids to join in on the roaring. 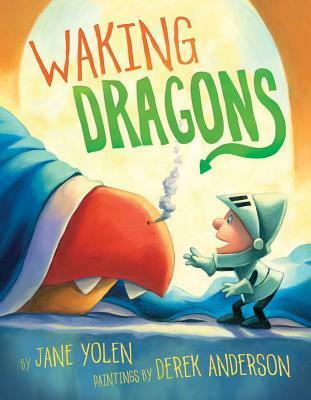 Publisher/Date: first published as Dragon Loves Penguin in Great Britain in 2013 by Bloomsbury Publishing Plc, Published in the United States of America in October 2014 by Bloomsbury Children’s Books, c2013. Publisher/Date: Simon & Schuster Books for Young Readers, an imprint of Simon & Schuster Children’s Publishing Division, c2012. An unnamed knight, followed by his equally fearless pooch, is reminded by his mother’s note to wake the dragons before school. This is a big task for such a little guy, especially since there are two dragons to not just wake up but get dressed, fed, and prepared for the day. While it seems questionable that the dragons would wear pajamas but not wear clothes during the day, Anderson’s details are adorable, including bed posts shaped like castle towers, a ladder for the tiny knight to ascend to the dragons’ bed, and a fire extinguisher at the ready during teeth brushing “in case of dragon breath”. The rhymes are simplistic, although the division of verses across multiple pages (sometimes just two words on a page) necessitates pre-reading before sharing aloud in a group. 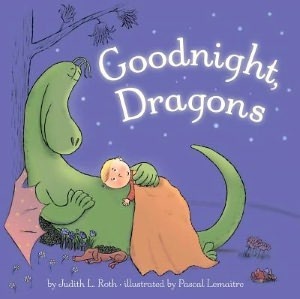 Good for a dragon themed story time where you’re looking for a shorter, less complex story. Publisher/Date: Marshall Cavendish Corporation, c2011. 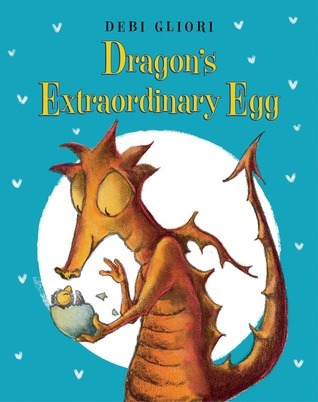 An underwhelming story, Hedgehog and Rabbit stumble upon a dragon’s egg and take the resulting dragon home with them. 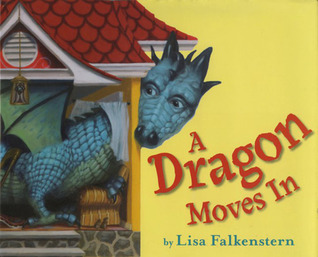 When the dragon’s growth means he gets stuck in the house, the house gets destroyed in the process of getting him out, and Hedgehog, Rabbit, and Dragon move on to build him a new one. There is nothing to distinguish the characters from one another. The spreads with lots of white space just look like they are missing their background, and twice she resorts to double page spreads of flying objects, with the equivalent of old comic book words superimposed (BANG! BAM! BOOOOOOM!). Details would have helped draw in dragon fans. 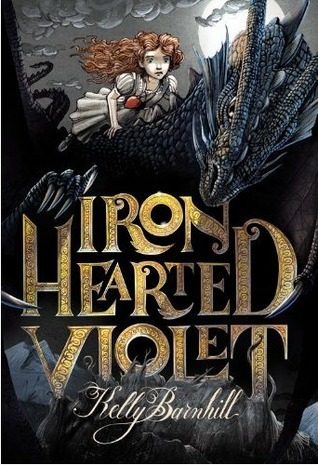 Publisher/Date: Disney Hyperion Books, an imprint of Disney Book Group, c2012. Pastel colors yield a soothing feel to what you think is going to be a dragon hunt. But the reason the child is hunting dragons is to hug them, feed them hot chocolate, and tuck them in under warm blankets. Proving that nothing is as fierce as it seems, the bird’s eye view of the four dragons cuddled close to woodland creatures is a delight to see. Suggested as a wind-down from a busy day spent dragon taming. Publisher/Date: Simon & Schuster Books for Young Readers, c2011. This book defies explanation. Cedric the dragon presents his mother with a bedtime story book, then implores her to read it again and again and again. His mother obliges and gets more and more frustrated, seemingly altering the story to fit her mood and circumstances until… well the book ends in a completed unexpected and unexplained way. There seems to be an aspect of meta-fiction, but I’m uncertain how much that applies to the whole book. This one has me scratching my head, between the ending and the colors and the narration. Maybe I’m just not the right audience. Publisher/Date: Tiger Tales, an imprint of ME Media, LLC. c2013. Let’s end this list on a high note. What personality! Martin is a dragon who dreams of flying but his wings are too small. His antics while attempting to get off the crowd are humorously and colorfully portrayed. The one page that gave me pause is when I don’t think it’s indicated as well as it could have been that Martin went down the hill instead of over the ledge, but it’s a small quibble. Martin’s body reminds me of an obese kangaroo with wings and a tail, and those wings by the end of the book are beautiful, subtly showcasing the transformation that Martin undergoes. The expressions convey so much feeling with just a tilt of a head and floppy ears, and his child helpers accept the presence of a dragon without question. 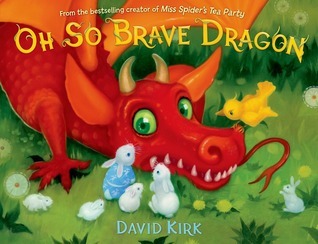 This is a CUTE book, and everyone should become acquainted with this dear dragon. Am I missing any of your favorites? Let me know in the comments. I waited so long to post this review because I was on the Cybils committee the year this was a finalist, and I didn’t want to post it immediately after the results were announced. Publisher/Date: Harcourt an imprint of Houghton Mifflin, c2012. Fifteen-year-old Jennifer Strange is the manager, receptionist, booking clerk, and taxi service for Kazam Mystical Arts Management, an employment agency for magicians, soothsayers, shifters and other “mystical artisans.” Originally slated to serve as an apprentice but taking over after the owner mysteriously disappeared, she has little authority with her employees. Business is literally dying as magic is drying up. Most suspect magic is tied in some way to the dragons that have been held in reserves meant to keep the peace between humans and dragons. Rumor and premonitions predict the immanent death of the last surviving creature, and possibly the death of magic as well. Jennifer sets out to save the company and her position, the only things she values, before Big Magic brings unwanted changes and possible war. This was a book that I enjoyed more with a second reading than I did after the first. It’s not something I would give rave reviews for, but still something I would recommend. Readers are thrust into the story with little introduction, and the fast pacing and detailed descriptions make it difficult to catch up with what’s going on originally. There are a lot of complex satirical themes that recommend itself to teen or tween readers, such as capital and corporate gains, political maneuverings, and legal wrangling that are used to manipulate events one way or another. Jasper Fforde handles all these angles with skill, but I’m just not sure how well I could summarize them when recommending it to readers without revealing too much. There’s a somewhat anticlimactic twist at the end that I didn’t see coming and still don’t fully understand the magic involved in its resolution. I think my favorite part of the whole story was the characters. Jessica is a no-nonsense, independent thinker who comes to her own resolutions and holds to her beliefs in a community that is corrupted by greed. The book doesn’t have the fight sequences that you would expect in a book titled The Last Dragonslayer but for people who want a unique fantasy with some social commentary mixed in, this is a good place to start. “By attacking random dragons?” Glory cried. “In another moment they would have been gone! And what are you doing?” She jabbed Clay in the side with one of her wings. “Uh,” Clay mumbled. “Fixing him.” He kept thumping the SkyWing’s chest. “What?” Glory yelped. “You can’t let him live!” She tried to grab one of Clay’s forearms, but Tsunami shoved her away. Tsunami has always imagined her homecoming like a fairy tale, and once she discovers that she actually is a SeaWing princess, she is even more determined to meet her family and see her kingdom. Maybe her own kind would appreciate her more than the dragonets, who seem to be questioning her leadership skills after the recent events and fighting with the Skywings. Upon arriving home though, Tsunami realizes that home is not a safe place, as the heirs to the throne continue to be killed by an unknown assassin. 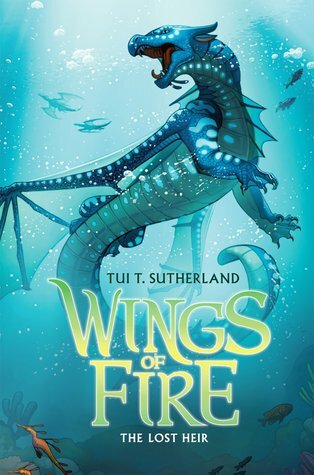 When her own life is threatened and she faces growing distrust towards her mother’s advisors and allies, Tsunami begins to wonder if maybe she is better off with her fellow dragonets of prophecy, but will she figure out who to trust in time to save her friends and family. Fans of the first book in the series will find much of the same. Now that we’ve been introduced and readers are getting to know the dragons individually, it’s marginally easier to tell them apart. That doesn’t mean I still didn’t find myself flipping back and forth between the guide, the prophecy, and the part I was actually reading to keep the alliances straight. It was just being reintroduced instead of being revealed for the first time. It’s like getting introduced to a friend’s family at an event. The first time you meet the whole crowd, your head is spinning, but by the second or third time you start making connections–about who’s a cousin and an aunt or a grandparent or siblings–and saying to yourself “I remember that.” Hopefully, by the end of the series the characters will become more familiar to readers in that same way. I enjoy how the author is featuring each dragon in their own book. We get to focus on more insular events instead of trying to grasp a nationwide war. I have a feeling each dragon is going to get their own book, and I’m especially interested to see how each dragon’s opinions differ from each other as we come to distinguish them from one another. There’s no denying that Tsunami is bossy, and discovering she’s royalty only augments her feelings of entitlement. But she’s also conflicted, especially when it comes to her own behavior and actions and how she is seen by others. She rationalizes her feelings in order to try to gain and keep her relationships, but her people pleasing, especially when it comes to her mother, just leaves her feeling out of sorts. It’s a story about not just who you can trust but whether or not you can trust yourself. The mystery is intriguing and Sutherland sends up several red herrings before revealing the cause of the dragonet deaths. We also get little glimpses of what is going on with the resistance, and hints of a “back up plan” if the dragonets don’t succeed. What exactly Tsunami and her group are supposed to do, readers are still as clueless as the dragons. I’ll be continuing the series to see what happens and how events develop. Publisher/Date: Scholastic Press, an imprint of Scholastic Inc., c2012. Clay clenched his talons under the water. They had to be talking about Glory. “Well, I’m not doing it,” Webs said. “So how and when,” Dune said in his no-nonsense military voice. “Drowning would be simplest.” He glared at Webs. Clay had heard enough. He sank down below the surface and swam toward the gap in the wall. What do we do? What can we do? What can I do? 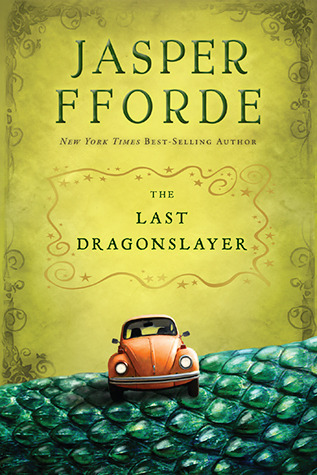 Clay and four other dragons have been living under a mountain for years in the hopes that they were meant to fulfill a prophecy and end a war between the dragon clans. After Clay overhears his caretakers threatening to kill one of his friends because she doesn’t fit the prophecy’s specifications, the five dragons make an escape attempt. Their attempt is foiled almost immediately, and their separation and capture puts them in an even more dire situation. As their entire lives are called into question, doubts begin to surface about their abilities and loyalties to each other. If one of them dies, will the prophecy ever be fulfilled? Readers picking up this book need to be patient from the beginning. What begins as a slow start quickly turns into a confusing situation, with five dragons, each a different breed and with different abilities, being cared for by three caretakers, also each a different breed of dragon and with different abilities. There are seven types or breeds of dragon total, but two of the breeds aren’t involved in the war, although they are represented by two of the young prophecy dragons, and one prophecy dragon was a “substitution” and isn’t mentioned in the prophecy at all. Sutherland tries to make it easier for readers by opening with “A Nightwing Guide to the Dragons of Pyrrhia,” but for the first third of the book I found myself flipping back and forth. The dragons are sometimes referred to as type and not by name, so getting them straight takes some effort. And is anyone else confused by the cover, which has the series name in BIG BOLD font, and then the actual title of the book looking like a subtitle? Once you get into the story and the young dragons have been captured, it gets a little better, but only a little bit. I do like the different attributes given to each breed, some of which are explained by the end of the book. The whole premise of the prophecy is a little sketchy simply because of the slow start, but I’m assuming with book number two we’ll get more details about what the young dragons intend to do in order to save their world. It brings into question the whole aspect of destiny. Does choosing these dragons put them on the path to fulfill their destiny, even if one is a “substitution?” Friendship is also a major theme in this book, as the dragons’ loyalty to each other is called into question, and they must play up their strengths and weaknesses to help each other. The book has some violence that I think sensitive readers might be bothered by, especially when we encounter the gladiator style fighting arena. The callousness of some of the dragons is also eye-opening if we think of them and their relationships in human terms. This behavior might ring truer to character if we compare the dragons to other wild animals and how they act, which actually makes sense considering Sutherland is part of the team of writers responsible for the Seekers series. I do appreciate the fact that the dragons are the main characters here, as opposed to most fantasy when they are merely secondary or supplemental (think Tamora Pierce, Anne McCaffrey, or Christopher Paolini). Overall, the quest and multitude of characters and species brings to mind Lord of the Rings, and complicated fantasy fans would more than likely enjoy the developed characters and unique setting. I know that’s why I’ll be reading the second one, since spending all that time figuring out who was who would be a waste otherwise. Publisher/Date: Random House, Inc., Listening Library, c2010. Living with her mother and father in a small and sparse mountain village, young Minli toils with them over the land to yield the bare minimum of food. 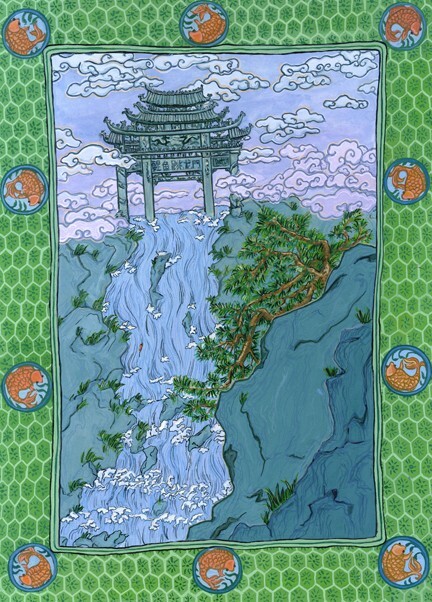 Minli enjoys listening to her father’s stories of dragons and the Old Man on the Moon, but she can’t block out her mother’s discontented sighs for greater wealth. Taking it upon herself to improve her family’s fortune, Minli sneaks away from her home in search of the Old Man on the Moon. Her journey is anything but easy, as she encounters magic around every turn that test her strength and resilience. I was pleasantly surprised by the narration. Janet Song does not distinguish the character voices so they are instantly recognizable. Instead, her soothing tone makes you feel like you’re being read a bed time story or sitting around a camp fire with your family. It’s an intimate experience where you can envision she’s talking right to you, and I thought she was a perfect choice for this story that’s essentially a string of inter-connected shorter stories. This book is perfect for bed time reading as the sections are quite short and snippets can be read as desired or as time dictates. Grace Lin weaves these stories together effortlessly, as one segues into another and they all come together at the end. 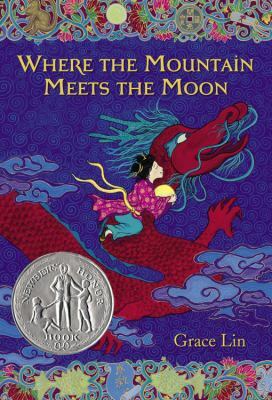 The alternating points of view give listeners and readers a glimpse into not only Minli’s perspective, but also takes turns showing us the thoughts and feelings of Minli’s parents and other characters, including a dragon. This gives readers a connection to all the stories. A wonderful, understated gem of book that sparkles from the inside, it has a satisfying happy ending that is a result of unexpected actions. I hope someone used this Newbery Honor Book for their Summer Reading program of One World Many Stories, because this would have coincided well with that theme.